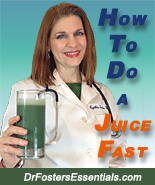 "A natural approach to achieving a healthy weight. 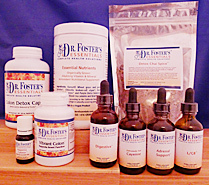 Here at Dr. Foster's Essentials, we do not believe in consuming stimulants to produce a temporary weight loss. People who take a "stimulant" formula can develop anxiety, rapid heartbeat, irregular heartbeat and develop a tolerance to the formula, only to regain all the weight back after several months. Stimulants are NOT necessary in order to lose weight. This is a serious one month program with 9 potent herbal products designed to produce a shift in all crucial body systems: digestive, liver, hormonal, circulation and appetite control with the desired outcome of better health and energy level as a result. SPECIAL: Save 10% off compared to buying items separately." Vibrant Colon, Colon Detox Caps, L/GB, Detox Chai, Cayenne Tincture, Appetite Calmer, Female Magnetism, Digestive Formula, Essential Nutrients (or Earths Nutrition Powder). This is a one month long program. Vibrant Colon has a laxative effect. People who suffer from chronic diarrhea/colitis should order this program without the Vibrant Colon. Vibrant Colon should not be combined with over the counter or other brand herbal laxatives.